As we learned the other day, ice-shaving machines are critical to our national security, and as an additional bonus can also be used to make snow-cones. (Though some have argued with a straight face that the snow-cone function itself is part of the homeland-security mission.) As we then learned on a different other day, though, the government has been vastly overpaying for these critical items, leaving many areas woefully undericed. (Having been to Michigan many times, I didn't think ice shortages were a problem this time of year anyway, but I guess they are planning ahead.) New information suggests a possible solution, however. 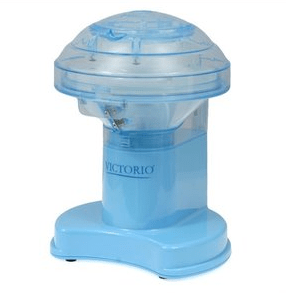 It turns out that a snow-cone maker/ice shaver is available from Walmart.com for just $31.95. Although shipping is another $8.97 apiece, for this price the original $11,700 spent by Region 6 could still have bought 285 machines, enough to provide all of Michigan's 83 counties with not just one but three ice-shaving machines, with 36 left over to enhance security in Detroit (unless they are planning to burn that down for the insurance money). This machine is clearly not as capable as the Arctic Blast that Region 6 chose to deploy in western Michigan. It's much smaller and just does not have the same capacity, or even one-third of the capacity (although if all 285 were concentrated in Region 6 they might do the job). So at first I thought the submitter's proposal would leave America dangerously vulnerable, which is why I called the FBI because if you see something, say something. But on reflection, this might have its uses, precisely because it is so small. At just one pound and about nine inches tall, the VKP1100 is man-portable, and so could be deployed much more rapidly and into areas that could never be reached by the Arctic Blast or anything similar. In fact, since the shaved ice is said to be so useful for ice packs in emergency situations involving injury or overheating, they could be issued to our troops in Afghanistan, who frequently have to deal with extreme conditions and difficult terrain. I guess we would have to airdrop the actual ice, but that's just a question of whether we're willing to do what it takes.